Watercolour of carvings from Birbal's House at Fatehpur Sikri from 'Views by Seeta Ram from Tughlikabad to Secundra Vol. VIII' produced for Lord Moira, afterwards the Marquess of Hastings, by Sita Ram between 1814-15. Marquess of Hastings, the Governor-General of Bengal and the Commander-in-Chief (r.1813-23), was accompanied by artist Sita Ram (flourished c.1810-22) to illustrate his journey from Calcutta to Delhi between 1814-15. Illustration of the details from Birbal's Hosue, at Fatehpur Sikri, a palace city built by Emperor Akbar (r.1556-1605). The Birbal Bhavan may have been part of the Haram Sara (Imperial Harem), accommodating the Emperor Akbar's senior queens, Ruqayya Begum and Salima Sultan Begum. Alternatively it may have been used for administrative or ceremonial purposes, rather than as a residence. Built in 1572 it is a two-storey building with two dome-topped upper rooms which provided separate accommodation for the queens. Delicate carvings covers the building both inside and out with motifs derived from Hindu and Muslim Indian architecture. 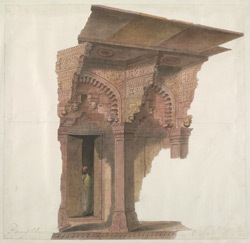 Illustration shows the details of the doorway, brackets and 'chajja' of Raja Birbal's House at Fathpur Sikri. Inscribed below: 'Architeetmal Ornaments enlarged of Beerbool's Daughter's House at Futtipoor Seehnee,' with remains of original pencil inscription on the drawing itself.